University of California San Diego computer scientists have completed the first comprehensive evaluation of Intel’s new Intel Optane DC Persistent Memory Modules (Optane NVDIMMs). Optane DIMMs aim to extend the memory capacity of servers while also preserving data across power failures—enabling order-of-magnitude increases in performance compared to conventional hard drives and solid-state drives (SSDs). The new memory (and similar technologies) have been in development for over a decade. The official release of the memory has been eagerly anticipated by researchers and potential customers like Google, Facebook, Amazon and other companies that require enormous memory capacity and storage performance. 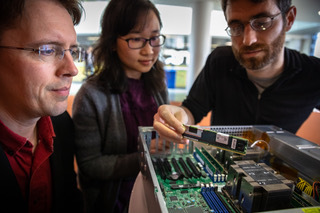 “With a large variety of data-intensive applications—across big-data analytics, media processing, and computer vision domains—we also investigated the underlying software and hardware behaviors of computer systems with Optane DIMMs, traditional DRAMs, and DRAM-cached Optane DIMMs,” said Zhao, who is an assistant professor in the computer science department at UC San Diego.